Halloween Horror Nights VII: Frightmares featured three haunted houses and the return of the popular “Midway of the Bizarre” scarezone. 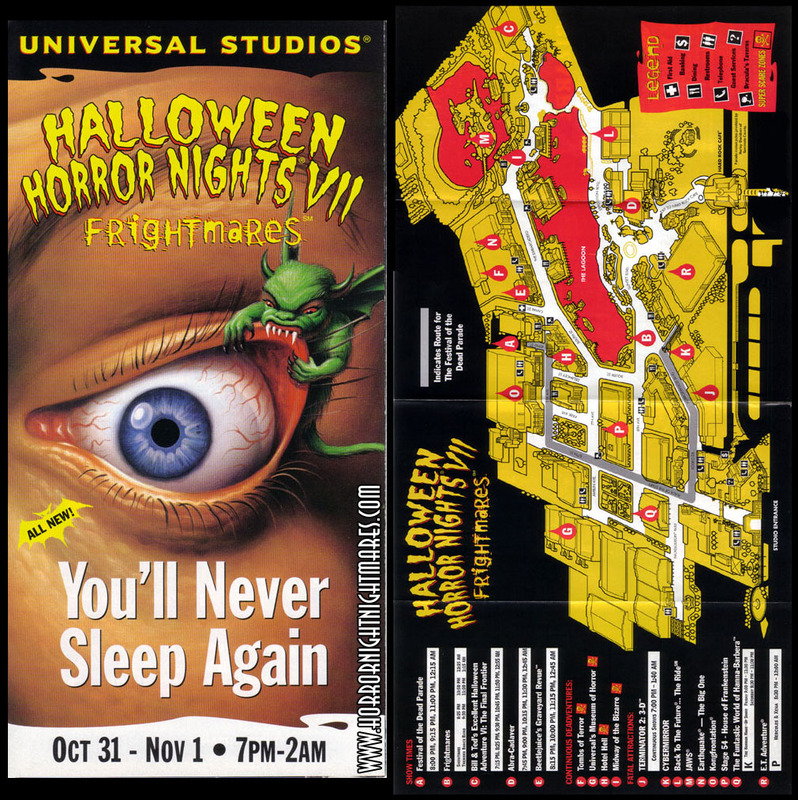 One strong point of interest to this years event was the actual logo – to this day it remains one of the most recognized pieces of Halloween Horror Nights artwork, the image depicts a green demon biting the eyelid of a frightened victim. Gates opened at 7:00PM till 2:00AM. Check into one of the trendiest hotels in New York…at least, it was before it became the crumbling home to hostile ghosts, menacing phantoms, demented staff members and violent bums. A terrifying journey into a New Orleans cemetery leads you deeper and deeper into the dark world of blood-thirsty vampires, murderous mutants and deranged, chainsaw-toting maniacs. The world’s only museum where the guards have to warn the exhibits not to touch the visitors! Here, all your favorite Classic Universal Monsters and present day horror icons come to life…much to your dismay. Beware the knife-wielding clowns and horrifying sideshow acts. Try your luck and win a prize of lose your life. Party on with Bill and Ted as these two most excellent dudes encounter awesome heroes and bogus villains from the movies and TV. The streets come alive with the walking dead in this ghoulish procession of nightmarish floats, costumed creatures and ghostly surprises. Party loud enough to take the dead! Your worst nightmares take center stage as some of your favorite stars gather for an all night, tongue-in-your cheek rock ‘n’ roll spectacular.